Geordi and Ro coming back "in phase"
"The Next Phase" is the 124th episode of the American syndicated science fiction television series Star Trek: The Next Generation, the 24th episode of the fifth season. In this episode, the Enterprise responds to a distress call from a Romulan science ship. Lieutenant Commander Geordi La Forge and Ensign Ro Laren are lost in a transporter accident when returning to the Enterprise with a faulty generator from the Romulan ship. As the Federation starship Enterprise responds to a distress call from a Romulan ship which has suffered an on-board explosion, Ensign Ro and Lieutenant Commander La Forge are seemingly lost in a beam-in from the Romulan ship to the Enterprise. Ro and La Forge find themselves on the Enterprise, unable to interact with the ship or the crew, but able to interact with each other. While La Forge believes they are still alive, Ro sees Dr. Crusher make out their death certificates and believes they are dead; she tries to make peace with her former crewmates as they prepare a funeral service. Commander Data traces the cause of the transportation accident to the Romulan ship. Ro and La Forge go along with Data and Lt. Worf as they fly a shuttlecraft to the Romulan ship. Aboard, La Forge discovers a phase inverter device, and theorizes that he and Ro are out of phase, and thus undetectable. He also overhears the Romulan crew discussing a plan to transmit a signal to the Enterprise that will cause the warp core to explode the next time the ship enters warp. The two return with Data and Worf to the Enterprise to try to warn the crew, unaware that a Romulan, also out-of-phase, is following them. On board the Enterprise, La Forge watches Data as he analyzes the data from the Romulan ship, and discovers high levels of chronoton emissions, part of the failing of the transporter system. La Forge recognizes that by passing through objects on the ship, he can create those emissions, and tries to encourage Data to study them more, but fails. Ro encounters the Romulan, armed with a disruptor, and leads him on a chase through the walls of the crew quarters, releasing more chronoton radiation that catches Data's interest. When Data enters the room where the Romulan has cornered Ro, La Forge rushes the Romulan, causing him to fly through the external hull of the ship into space. La Forge recovers the disruptor. Although Captain Picard orders the ship into warp after their investigation is complete, Data cautions him to not do so until he completes a sweep of the ship with "anyon" particles to remove the chronoton radiation. Knowing that time is short before the ship will enter warp, Ro and La Forge head to their funeral—which has become more of a festive wake and celebration—and attempt to phase through objects. They fire the Romulan's disruptor to attract the attention of the attendees. When this does not work, Ro sets the disruptor to overload, causing a large burst of chronoton radiation. 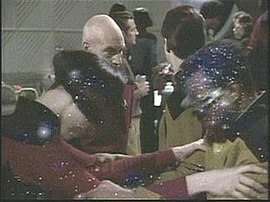 Data instructs the computer to sweep Ten Forward with anyon particles, causing Ro and La Forge to temporarily become visible in front of Data and Picard. Data deduces the fate of the crew members, and orders another massive flood of anyon particles, which brings Ro and La Forge back into phase. La Forge is able to warn Engineering about the warp core in time. He and Ro then join their "funeral" and celebrate with the rest of the crew with a much more joyous tone to the occasion. Wikiquote has quotations related to: "The Next Phase"
This page was last edited on 9 January 2019, at 15:51 (UTC).